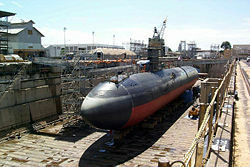 U.S. Navy submarine USS Greeneville in dry dock, following collision with a fishing boat. A dry dock is a narrow basin or vessel that can be flooded to allow a load to be floated in, then drained to allow that load to come to rest on a dry platform. Dry docks are used for the construction, maintenance, and repair of ships, boats, and other watercraft. Some dry docks are designed mainly for ship construction, whereas others are intended for repairs and maintenance. 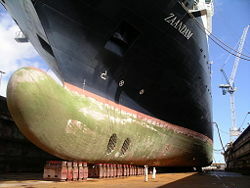 The latter types of dry docks may be used for cleaning a ship's hull (such as removing barnacles and rust), repainting, or repairing battle damage. Holland America Line's passenger cruise ship MS Zaandam dry docked at Grand Bahama Shipyard, Freeport, Grand Bahama in January 2003. But after that (the reign of Ptolemy IV Philopator) a Phoenician devised a new method of launching it (a ship), having dug a trench under it, equal to the ship itself in length, which he dug close to the harbor. And in the trench he built props of solid stone five cubits deep, and across them he laid beams crosswise, running the whole width of the trench, at four cubits' distance from one another; and then making a channel from the sea he filled all the space which he had excavated with water, out of which he easily brought the ship by the aid of whatever men happened to be at hand; then closing the entrance which had been originally made, he drained the water off again by means of engines (organois); and when this had been done the vessel rested securely on the before-mentioned cross-beams. Athenaeus recorded the event 400 years later (around 200 C.E.). There is, therefore, reason to believe that dry docks had been known throughout classical antiquity. At the beginning of the dynasty (c. +965) the two Che provinces (now Chekiang and southern Chiangsu) presented (to the throne) two dragon ships each more than 200 ft. in length. The upper works included several decks with palatial cabins and saloons, containing thrones and couches all ready for imperial tours of inspection. After many years, their hulls decayed and needed repairs, but the work was impossible as long as they were afloat. So in the Hsi-Ning reign period (+1068 to +1077) a palace official, Huang Huai-Hsin, suggested a plan. A large basin was excavated at the north end of the Chin-ming Lake capable of containing the dragon ships, and in it, heavy crosswise beams were laid down upon a foundation of pillars. Then (a breach was made) so that the basin quickly filled with water, after which the ships were towed in above the beams. The (breach now being closed) the water was pumped out by wheels so that the ships rested quite in the air. When the repairs were complete, the water was let in again, so that the ships were afloat once more (and could leave the dock). Finally, the beams and pillars were taken away, and the whole basin covered over with a great roof so as to form a hangar in which the ships could be protected from the elements and avoid the damage caused by undue exposure. Floating Dock. Woodcut from Venice (1560). In Europe, the first dry dock, and the oldest surviving one, was commissioned by Henry VII of England at HMNB Portsmouth in 1495. Possibly the earliest description of a floating dock comes from a small Italian book printed in Venice in 1560, called Descrittione dell'artifitiosa machina. In the booklet, an unknown author asks for the privilege of using a new method for the salvaging of a grounded ship and then proceeds to describe and illustrate his approach. The included woodcut shows a ship flanked by two large floating trestles, forming a roof above the vessel. The ship is pulled in an upright position by a number of ropes hanging down from the roof. The Harland and Wolff cranes in Belfast, Northern Ireland. Harland and Wolff Heavy Industries in Belfast is currently the largest in the world and is close to the slipway on which the ill-fated RMS Titanic was constructed. The massive cranes are named after the Biblical figures Samson and Goliath. Goliath stands 96 meters (m) tall, while Samson is taller, at 106 m.
Northrop Grumman Newport News Shipbuilding's Dry Dock 12 is the largest dry dock in the United States. The Saint-Nazaire's Chantiers de l'Atlantique owns one of the biggest in the world: 3937 feet x 196.85 feet. 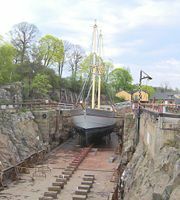 The brig Stockholm in one of the historical dry docks on the island Beckholmen in central Stockholm. The classic form of dry dock, properly known as a graving dock, is a narrow basin, usually made of earthen berms and concrete, closed by gates or a caisson, into which a vessel may be floated and the water pumped out, leaving the vessel supported on blocks. The keel blocks as well as the bilge block are placed on the floor of the dock in accordance with the "docking plan" of the ship. Some fine-tuning of the ship's position can be done by divers while there is still some water left to maneuver it about. It is extremely important that supporting blocks conform to the structural members so that the ship is not damaged when its weight is supported by the blocks. Some anti-submarine warfare warships have protruding sonar domes, requiring that the hull of the ship be supported several meters from the bottom of the dry dock. Modern graving docks are box-shaped, to accommodate the newer, boxier ship designs, whereas old dry docks are often shaped like the ships that are intended to be docked there. This shaping was advantageous because such a dock was easier to build, it was easier to side-support the ships, and less water had to be pumped away. U.S. Navy ballistic missile submarine USS Michigan inside a flooded dry dock. Dry docks used for building Navy vessels may occasionally be built with a roof. This is done to prevent spy satellites from taking pictures of the dry dock and any ships or submarines that may be in it. During World War II, covered dry docks were frequently used by submarine fleets to protect them from enemy air raids, however their effectiveness in that role diminished after that war. Today, covered dry docks are usually used only when servicing or repairing a fleet ballistic missile submarine. Another advantage of covered dry docks is that one can work independently of the weather. This can save time in bad weather. The towboat, DAUPHIN I, in a floating dry dock on the Mississippi river in Algiers, Louisiana. The battleship USS Iowa uses a floating dry dock during World War II. A floating dry dock is a type of pontoon for dry docking ships, possessing floodable buoyancy chambers and a "U" shaped cross-section. The walls are used to give the dry dock stability when the floor is below water level. When valves are opened, the chambers are filled with water, the dry dock floats lower in the water, allowing a ship to be moved into position inside. When the water is pumped out of the chambers, the dry dock rises and the deck is cleared of water, allowing work to proceed on the ship's hull. Shipyards operate floating dry docks, among other means of hauling or docking vessels. The advantage of these dry docks is that they can be moved all over the world and also can be sold second-hand. During World War II, the U.S. Navy used floating dry docks extensively to provide maintenance in remote locations. One of these, the 850-foot AFDB-3, saw action in Guam, was mothballed near Norfolk, Virginia, and was eventually towed to Portland, Maine, to become part of Bath Iron Works' repair facilities. A modern floating dry dock. Besides the use of graving docks and floating dry docks, ships can be dry docked and launched by several other methods. For example, a slipway or patent slip consists of a ramp extending from the shoreline into the water. A shiplift consists of a platform that can be lifted and lowered vertically by a number of hoists. These systems may be used for the construction as well as repair of ships. Some boat lifts (or ship lifts) are used not for repair but for transporting boats between water at two different elevations. Some dry docks are used during the construction of bridges, dams, and other large objects. For example, the dry dock on the artificial island of Neeltje-Jans was used for the construction of the Oosterscheldekering, a large dam in the Netherlands, consisting of 65 concrete pillars weighing 18,000 tonnes each. The pillars were constructed in a dry dock and towed to their final place on the seabed. ↑ Athenaeus of Naucratis, The Deipnosophists, or, Banquet of the Learned of Athenaeus, Volume I, translated by C.D. Yonge (London: Henry G. Bohn, 1853), 325 (5.204c). ↑ Joseph Needham,Ling Wang, and Gwei-Djen Lu, Science and Civilization in China (Cambridge, UK: Cambridge University Press, 1971, ISBN 0521070600), 660. ↑ George Sarton, Floating Docks in the Sixteenth Century, Isis. 36:3/4:153-154 (153). ↑ No Higher Honor, FFG 58 under repair at Bath Iron Works. Retrieved September 6, 2008. Mazurkiewicz, B. K. 1980. Design and Construction of Dry Docks. Clausthal-Zellerfeld, Germany: Trans Tech Pub. ISBN 0878490361. Needham, Joseph, Ling Wang, and Gwei-Djen Lu. 1971. Science and Civilization in China. Cambridge, UK: Cambridge University Press. ISBN 0521070600. Pelletier, James Laurence. 1997. Worldwide Ship and Boat Repair Facilities: Shipyards, Repair Yards, Dry Docks. Augusta, ME: Marine Techniques Publishers. ISBN 0964491524. This page was last modified on 25 August 2013, at 18:56.